(ii) Members facing difficulties at this time to provide market access as set out above shall provide duty-free and quota-free market access for at least 97 per cent of products originating from LDCs, defined at the tariff line level, by 2008 or no later than the start of the implementation period. (b) Ensure that preferential rules of origin applicable to imports from LDCs are transparent and simple, and contribute to facilitating market access. DFQF market access for at least 97% (by tariff line) of exports from LDCs. Simple and transparent rules of origin. 83.4% (by value) of exports from LDCs were admitted to developed markets duty-free quota-free in 2011 (excluding arms and oil). Concrete progress has been made in the simplification of rules of origin for LDC products, with a number of developed countries adopting flexible rules of origin criteria for LDC products. 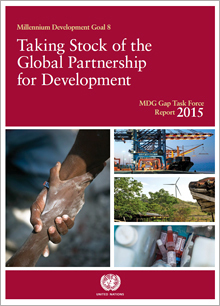 About 17% of exports from LDCs stiff face tarriffs. More flexibility and transparency in rules of origin needed. For related DFQF commitment, see the Brussels Plan of Action commitment.